In an excerpt from his new memoir, Redeeming Features, the designer Nicholas Haslam tells about hiding in a closet with the Duchess of Windsor and the wedding of his royal cousin, Princess Diana. Many of the invitations Margaret Case issued during my daily visit to her office upstairs on the 20th floor were shouted unabashedly from the open-doored loo. One day she came up with the most thrilling offer possible. The Duchess? Of Windsor? Would I?? Wallis Windsor was a Vogue icon. Only a few weeks before I had laid out a spread on the Windsors in their Paris house. The photographs, by Horst, might have been taken, some wag said unkindly, through concrete, so wrinkle-free were the features of both duke and duchess. Her hard, lacquered head, the scarecrow body in its exquisite clothes—part Ming empress, part bang-up-to-date modern—totally dominated the beautiful rooms, the witty 18th-century furniture, the Meissen, the dogs, the duke, with a kind of sexual artificiality that was undeniably intriguing. I knew all the drama and anger of the abdication, of course, but by the '60s the royal family was so safely established that that particular can of worms had somewhat lost its shelf life; the king-and-Mrs. Simpson business was simply seen as a romantic love story for him or an understandable career move for her. But many East Coast grandees were proud of their American royal, worshiped her drop-dead chic, her sassy wit, her exaggerated jewels, her perfectionism. To others, she was a hardheaded go-getter, a haughty social cipher, cadging her way off two continents. Which? The totem in the Horst photographs suggested both. The Colony, Thursday, 1 p.m. Margaret Case, with Kitty Miller and Cordelia Biddle Robinson, is already seated when I arrive. Our table is the best banquette, in the farthest corner, affording the longest walk to it, and the best view from it, in the room. These ladies are the duchess’s “set.” If she’s not natural with them... I think. The commissionaires swing open the doors. There’s a sudden silence: Eyes swivel, forks fall onto asparagus (“Without butter, Gene, please”). Across the restaurant—cheek-kissing, air-kissing, winking, waving—comes this minute figure, the flat Cubist head made higher and wider by black bouffant hair parted centrally from the brow to the black grosgrain bow at the nape, dressed in an impossibly wideweave pink angora tweed Chanel suit, concertinaed white gloves, black crocodile bag and shoes. As she approaches, not stopping, not stopping smiling, her eyes greet her friends. Then, “Hi, I’m Wallis,” to me, and, “I’ll have the chicken à la king, Gene, thank you,” to the hovering maître d.
“We call Nicky our Beatle,” says Kitty. “What on earth’s a Beatle?” says Cordelia, whose voice, appearance, and mannerisms hadn’t changed since the '20s. And she leaves, now stopping at some tables, a few words, her infectious laugh as metallic as the clink of spoons in astonished onlookers’ demitasse coffees (“No cream, Gene, please”). We stood shoulder to shoulder in the near dark, talking about our lunch, the theater—well, musicals—food, friends; what she called “where we’ve been and who we’ve seen,” till, “I think it’s OK now. Some frumps have just gone in.” She stepped out, bandbox-fresh. “Am I all mussed up? My hay-er? No? You’re so cute to say so. Come.” So with her jewel-appliquéd black-satin-gloved hand in mine, we walked into Elsie’s party. The announcement that Prince Charles was engaged to Lady Diana Spencer meant a cousin would become Princess of Wales and, it followed, the next queen. Our family relationship was fairly distant. Though her uncle Robert Spencer habitually addressed my mother as “Cousin Di,” this was due more to jocular old-fashioned manners than familial closeness, and my mother’s by-now great age, and Diana’s extreme youth put them generations apart. Until I saw the see-through skirt photographs I was hardly aware of her existence, though I had come across her sisters Sarah and Jane. Suddenly this enchantingly awkward girl, with her shy, downward-lashed smile, badly cut hair, and hopelessly unchic clothes was thrust into a limelight glare stronger than anyone before her had had to endure. Sometimes reveling in her Georgiana Devonshire-like position, sometimes rabbit scared in the headlights, she made her virgin way to royal status with no one to guide her, no one to ask, only a set of contemporaries who treated her new position with either unmasked envy or mild derision. A few, perhaps necessarily aristocratic, older women were wise to the danger looming. Joan Aly Khan, herself married too young to a handsome prince, believed the age gap to be exactly wrong; that if Charles had been older he would have been bouleversé by her youth. Diana Cooper, perhaps remembering attempted matchmaking with a former Prince of Wales, and slightly put out that “Lady Diana” no longer signified exclusively her, was rather appalled by the determination of her friends Queen Elizabeth and Diana’s hard-bitten grandmother, Ruth Fermoy, to force the marriage. She was, however, entranced by her namesake’s poignant allure; when that one breast peeped innocently from Diana’s silken décolletage, she observed to me, “Well, wasn’t that a dainty dish to set before a king?” And of course there were coded asides about Mrs. Parker Bowles, waiting patiently in the wings, while her husband carried on an affair with the prince’s sister. The preparations for the wedding included me insofar as David and Elizabeth Emanuel, the young and green couturiers Diana had selected to make her dress, asked me to decorate their salon as an appropriate setting for the many fittings this would entail. We draped yards of cream silk on the walls and trailed it over the windows, David constantly flapping his hands to indicate a need for “another zhush, another bow.” As the end result had more zhushes and ruffles than the Emanuels eventually managed to cram onto the dress itself, it must have been difficult, at the final fitting, for Diana to tell where my decor ended and her frock began. A few days, later those yards of silk tumbled out of the coach as Diana drew up at Saint Paul’s. I had watched the procession from the balcony of the old Daily Telegraph building on Fleet Street, sitting among many newspaper grandees, a prime position engineered for me by its owner, Seymour Camrose, and his power-behind-his-Fleet-Street-throne sister-in-law Lady Pamela Berry. There were, naturally, oodles of Champagne and lashings of foie-gras, but the most delicious taste was left by the beauty of Princess Michael of Kent, in a hat and dress of palest lilac, like a twilit swan, passing along the cheering crowds in the Strand below. One understood then and there why the family she had recently married into might resent her style and looks as much as they had those of her equally beautiful mother-in-law, Princess Marina. Once the cavalcade had passed by on its return journey, its leader a near-child on her way to a tongue-tied honeymoon, there was a scramble to leave for the party the queen was giving to celebrate her son’s marriage. In order that important wedding guests would not experience any let-down, she had decided that her party should begin directly after the palace balcony appearances. And thus at 5:30, I changed into black tie and walked into the anteroom at Claridge’s, to the most extraordinary sight imaginable. Sitting in a semicircle, their eyes glued to a hastily erected screen, were the major participants in the ceremony, watching themselves on film that Liza Shakerley had somehow spliced together in less than an hour. Besides the entire royal family, and every king and queen regnant or exiled, there were Nancy Reagan, Princess Grace of Monaco, the empress of Iran, the crown prince of Japan, archbishops, archimandrakes, princelings, and potentates. “You know the queen of Romania, don’t you?” David Hicks said at my elbow. “Anne dear, may I present Nicky Haslam?” A slight, unassuming woman in a floral printed dress held out a jewel-less hand. Now David was in his element. “And look, there’s Alexander Romanov—with the old infanta. And just behind them is Maria del Gloria, Dom Pedro of Brazil’s eldest. Such a nice girl,” he added. Excerpted from Redeeming Features by Nicholas Haslam Copyright © 2009 by Nicholas Haslam. Excerpted by permission of Knopf, a division of Random House, Inc. All rights reserved. No part of this excerpt may be reproduced or reprinted without permission in writing from the publisher. 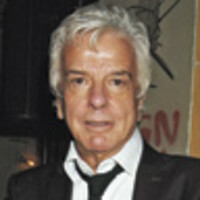 Nicholas Haslam is an interior designer and the author of Sheer Opulence. He has been a contributing editor at British Vogue and Tatler for many years and also writes for The World of Interiors and The Spectator. He lives in London and Hampshire.